Editor’s Note: The following Q&A is one in an ongoing series focused on health care delivery from the Center for Health Market Innovations. 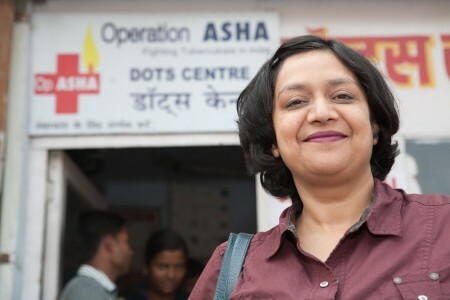 Operation ASHA is a community-based program founded in the Delhi slums to fight the spread of antibiotic resistant TB strains by incentivizing counselors to closely monitor progress of patients and ensure they finish courses of DOTS. Since our last post, they have been expanding at a dizzying pace. Energetic president and co-founder Shelly Batra, MD, talked to me about their plans to replicate not just in other Indian states but in Cambodia, Morocco, Ghana, and Kenya. Reis: Last time we saw you, you were demo-ing the patient tracking system you developed with Microsoft Research. How did the pilot go? Batra: It was very successful. We have established the biometrics tracking system in 17 centers over the past eight months and used it for more than 700 patients. Counselors must identify patients with a fingerprint scanner to receive medicine at the locations where we distribute DOTS [TB treatment]. Now our default rate is down to .5 percent, which is much less than usual default of 3 percent and significantly less than the usual default rate in urban slums-about 60 percent. Now we need to have the biometric tracking devices in our 140 centers, which will be 200 by the year’s end. We incur a one-time expense of $1000/center for each system, which includes the training of counselors, a 10-inch laptop computer, a fingerprint reader and a dedicated phone to send out SMS. Reis: Your 200 centers – where will they be located? Batra: In India, we are serving four million people in 14 cities of six states: Delhi, Punjab, Haryana, Madhya Pradesh, Rajasthan, and Uttar Pradesh-slum dwellers as well as people in more scattered peri-urban areas. Now we are planning to launch in two new states, Orissa and Chhattisgarh. In each state we will target [communities of a] half million people, many from impoverished tribes. We are also hoping to start work in West Bengal, a state of 91 million people. Reis: Are you working in rural areas too? Batra: In Madhya Pradesh, we are adding four million people in three districts that are predominantly rural. These villages each have 600-2,000 people. How does your model change for TB treatment in rural areas? We will select our counselors from the villages themselves. One large nodal village will serve as the focal point, where the senior staff and office will be based. The counselors will move in the periphery providing mobile-DOTS. Counselors must carry DOTS and over-the-counter medicine to treat symptoms, as well as data cards and the biometric devices. Some state officials have requested that we develop biometric devices additionally to track the immunization of children and deliver antenatal care to pregnant women. We are looking for funding and technology partners who can use their R&D and CSR departments to develop these systems for us. We would share the system with other NGOs and governments. Your incentive structure (which provides additional salary remuneration to counselors for case detection and tracking of missed doses) works well in cities because counselors can attend to a higher volume of patients in a day. What about in villages? We give incentives to our counselors for case detection and tracking of missed doses. Incentives ensure that counselors monitor patients’ treatment daily so patients do not default from their DOTS medicine over the six month treatment period. In villages of course the patient load is not as high. But the lower the patient density, the higher our incentive amount-so the total incentive amount will stay the same. What about patients who become resistant to medicine? Our results have shown that (multi-drug resistant) MDR-TB can be treated in the community. Just this month we got back the results from the first two patients we treated in the community who had MDR-TB. We were thrilled-they tested negative. Challenges abound, though. The treatment includes daily injections for the first six months, with very serious side effects. Retaining patients for two years (which is how long the MDR treatment takes) is a very big challenge. Our counselors respond by working even more intensively with these patients. Counselors are encouraged to treat patients like friends and talk with empathy and kindness. At the same time, they are careful to keep some distance from patients coughing out the bacteria. The cost for treating MDR-TB is just $400/ patient for the entire two years treatment and counseling-although high compared to our costs for treating regular TB patients, which is $30. (Above: Priya and Vijay with a patient’s “before” and “after” slip showing she is now cured of TB. Image credit: Andre J.P. Fanthome). What about your international expansion? We already have seven centers in Phnom Penh, Cambodia, and we are working on scaling to 40 centers to serve 1000 patients this year. For this we will need $100,000; we have 30 percent of this amount already. We have completed the ground work in Morocco, and are starting in Kenya and Ghana. We are looking for $100,000 of seed funding in each country. ABC news featured your work in the Delhi slums in a big way last December. We also recently won the opportunity to participate in a five-day conference for the India Development Marketplace in Jaipur. We talked about our model and showed our biometric devices. Then in January we presented in Bombay at the Spirit of Humanity award competition of the AmeriCares Foundation. I’m looking to presenting at SOCAP Europe in Amsterdam. How did you manage to scale up so quickly? Actually we had a very serious shortage of middle management about a year ago. Now we have at least 20 people at the middle management level including training staff, a person who works on government relations, and a Chief Technical Officer. Another reason why we were able to scale is because of support from donors. The sustainability of our model appeals to them: With a $6,000 investment, we can open a TB treatment center, which treats 90 TB patients year after year. Now I’m keen to learn from other grassroots organizations that have gone to scale. I am determined to avoid the hurdles of bureaucracy and keep our pulse on the patients.